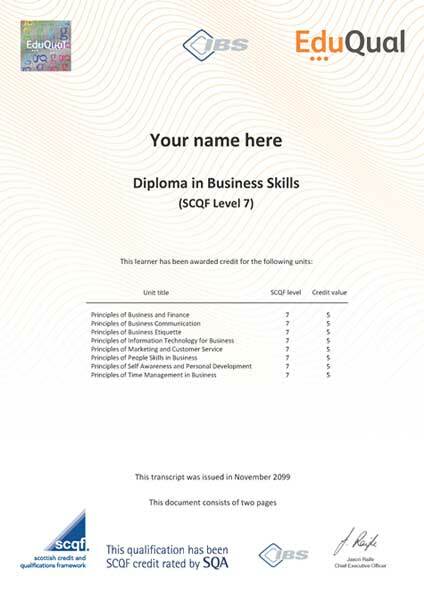 The Diploma in Business Skills (SCQF Level 7) is a 40 credit size qualification, consisting of 8 compulsory units and is a Regulated Qualifications Framework (RQF) equivalent Level 4 qualification. Students will be introduced to the many different aspects of international business in today’s world. Embarking on the qualification they will be exposed to both academic and vocational aspects of a wide range of subjects, enabling them to gain the necessary knowledge and skills vital for a career in business or further studies.